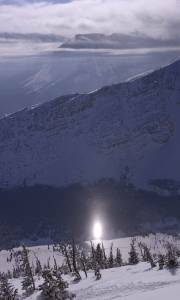 Pincher Creek (AB), Canada – The most common form of a rhombus is of course referred to as a diamond, and Castle Mountain is a diamond in so many forms. Unlike the ski resorts located inside the National Parks of Alberta, Castle is instead in a remote narrow valley well south of Calgary and approaching the cross-border Waterton Park although it’s almost a “you can’t get there from here” kind of situation as the road ends at the resort. With a small amount of development currently at it’s base, including a small hostel/hotel, a few condos and a couple of home sites, the nearest town of any size is Pincher Creek, 30 minutes away out on the plains. Pincher Creek is a small town focused on windmills and oil and gas production, not skiing. Castle Mountain started as a municipally owned local’s hill with very little going for it. Only surface lifts rose its flanks to a point not anywhere near the top of the mountain. Since it was bought by a small group of investors in the mid-90’s, however, it has experienced a slow but inexorable growth into a premier powder stash with some of the longest continuous steeps in Canada. It also doesn’t hurt that it gets over 350 inches of snow per season. It’s been a lot of boot strapping work and even now much of the infrastructure is considered to be a bit more “old school” than is found at the better known resorts. All four of Castle’s chairlifts came from a first life somewhere else. 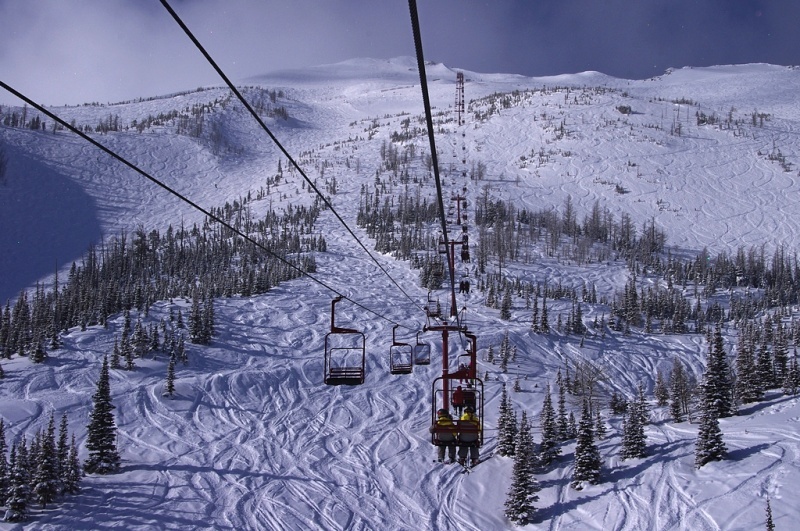 There are so few of them, yet they easily serve roughly 3,500 acres of ski and snowboard terrain. The layout is quite simple: the Huckleberry chair on the lower parts of Haig Mountain to looker’s left serves up nice groomers, the Green chair is for learners, and what locals call the Blue and Red chairs (the trail map gives them names) offer over 2,800 vertical feet of renowned steeps mixed with a few easier ways down the mountain. The steepest of the steeps are on opposite ends of the mountain in the famous South Chutes (be careful about the sun exposure’s sometimes detrimental effect on the snow in spring), and the newly gladed far northern portions such as North Star, which has some of the steepest and longest glades that I can recall skiing. In between there’s a whole host of blue and black bowls, runs, chutes and glades to keep you occupied. Want open glades? Try Drifter or Siwash. Want to lap the Red chair and stay up top? Sheriff and Outlaw serve up a wide open bowl of possibilities. 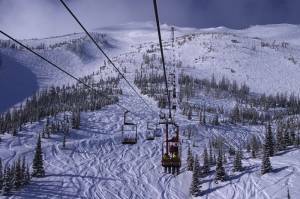 Locals refer to many days when you simply “triple the snow report,” which is apparently due to the unique weather of the area which can drop that much additional snow between the 5 a.m. snow report and opening time. The one note of caution for Castle is the wind. It can easily hit hurricane force, shutting the upper Red lift for an entire day or partial days at least several times a season. 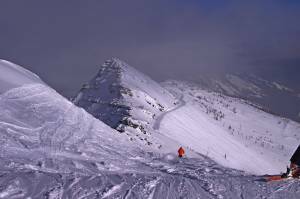 It also requires skiers to be very aware of rocks on the south side terrain and other alpine areas. The wind, on the other hand, can frequently sift the snow into fresh layers to even smooth out the bumps. One thing about the culture here, it’s tough to have a bad day. 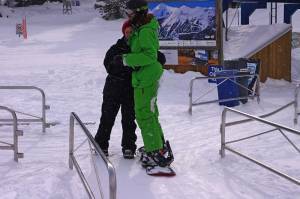 After all, you get a hug on every lap of the main mountain from liftie Marie Cameron. Seriously. She scans tickets and then hugs every person going up the blue chair – on every trip up. How can you beat that? We hit “typical” conditions on my day at Castle, as about six inches of new snow had fallen to make for a lot of fun in the South Chutes, the upper mountain bowls, and the glades of all densities and types that range over the main peak, Gravenstafel Mountain. I nevertheless wish that I had been there on a day when the new cat ski operation was open. Cat skiing was started on the further reaches of Haig Mountain just last season. If the terrain and snow there are anything like that on the main mountain, it must also be pretty epic. Once you’re done for the day, don’t forget to stop by the T-bar Pub which, now that there is a bit of lodging around, can get pretty lively especially on weekends. I also recommend stopping by the base of the main lodge to see all of the old trail and safety signage now hanging on the walls. It is a good reminder of how far the journey for has been for both Castle Mountain and the sport of skiing. That said, Castle Mountain’s transformation is not necessarily complete. There are plans for a few more things here or there around the resort. The investor group likes to take it slowly, which is a good thing, and has kept the mountain debt-free and positioned for success for a long time to come. Where to Stay: A combination hostel/hotel and just a few condos decorate the base of Castle Mountain. Few rooms exist, so book early if you want to stay at the still-remote base of the mountain. The best option in the closest town to Castle is the Ramada Inn in Pincher Creek. While Pincher Creek is not likely to be confused with a major ski town anytime in the near future, the two-year-old Ramada has nicely appointed, very large rooms on offer and a nice indoor pool, hot tub and even a curvaceous slide for the kids (ummm…sure, only for the kids).